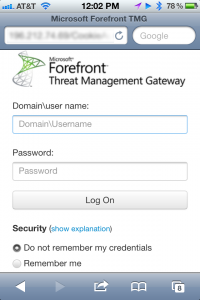 Microsoft Forefront TMG 2010’s Web Publishing feature enables you to securely publish internal sites such as Outlook Web Access and SharePoint to the external network. Using Forms Authentication to secure these sites is a good choice because with a little bit of work, you can customize the login form with your own corporate identity. 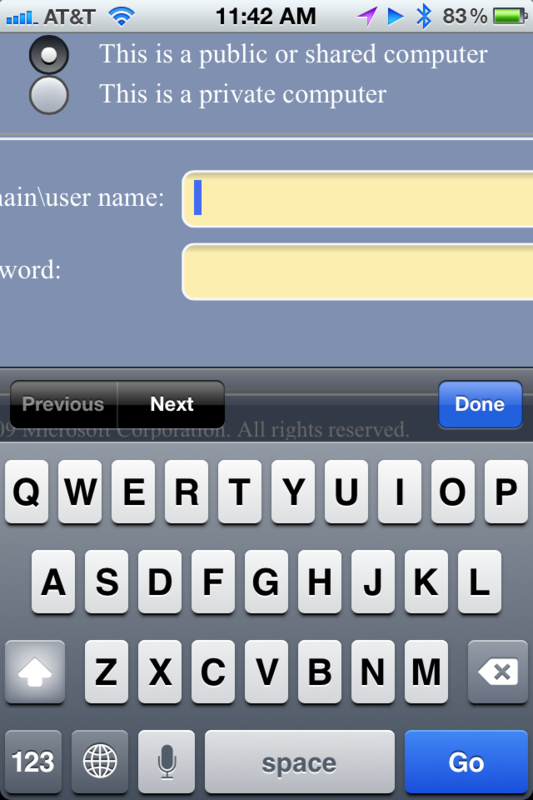 Sure, with a bit of zooming and scrolling you can eventually login using this form. But try logging in while driving between lunch meetings with a coffee in one hand! Suddenly the ability to login becomes a real chore. 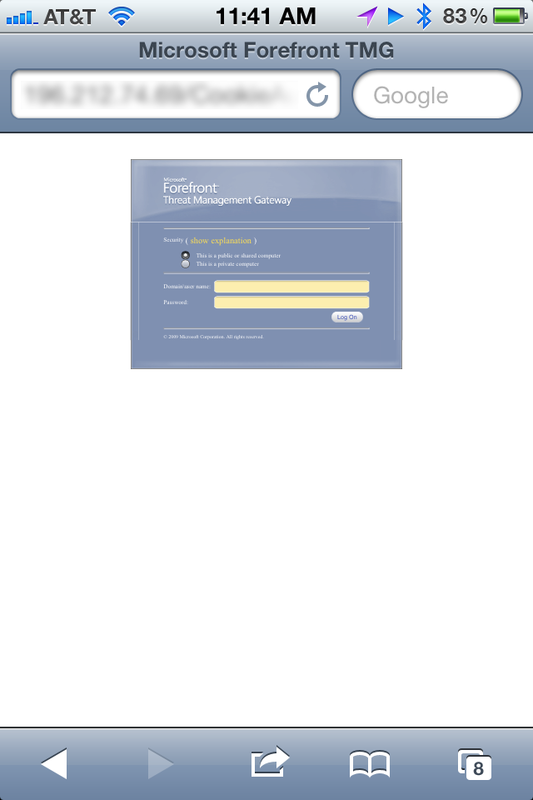 Fastvue does not condone driving while logging into corporate resources and drinking coffee. It’s very dangerous. Don’t do it. Really. The good news is that this template is free for you to download, modify and use in your environment. Download the template files here, or from the github repo. Extract the downloaded zip file into the HTML folder above. Replace the usr_pwd.htm file when prompted. In your TMG Management Console, edit your desired Web Publishing rule and go to the Listener tab. Click Properties. 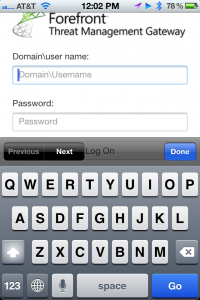 On the Authentication tab, ensure HTML Forms Authentication is selected. Click Apply and then apply the changes to TMG. Restart the TMG Firewall Service (Unfortunately TMG Caches these pages and restarting the service is the only way to clear it as far as I know). You can also replace the Forefront TMG logo with your own company’s logo. Simply replace the ‘Logo.png’ file with your own company’s logo. Again, you will need to restart the TMG Firewall service for the change to take effect. For now, only the usr_pwd.htm file has been customized. This file is served when using Windows (Active Directory) authentication (set on the Authentication page in step 5 above). I intend to customize the other forms (Radius and SecureID) soon. Feel free to contribute! 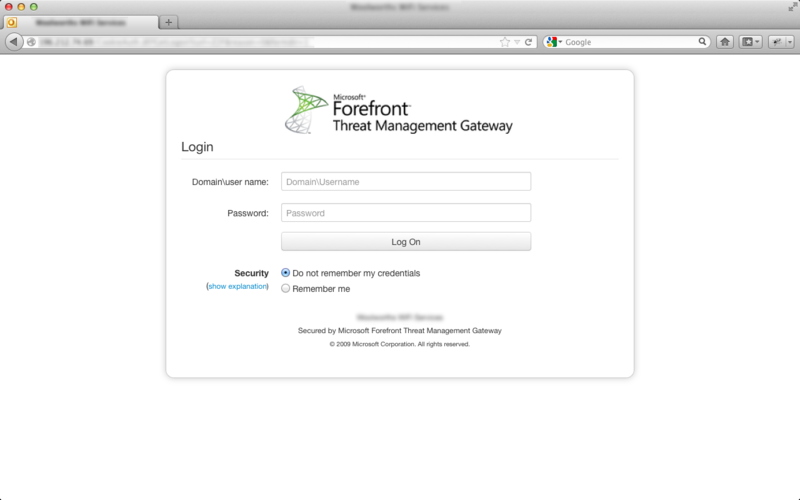 Very nice – it’s about time someone created some publicly available, alternative TMG logon pages. 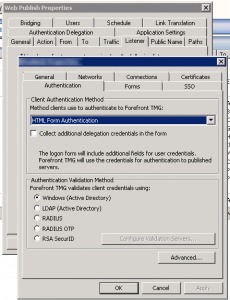 how to Configure and Implement http web proxy form based authentication in tmg. 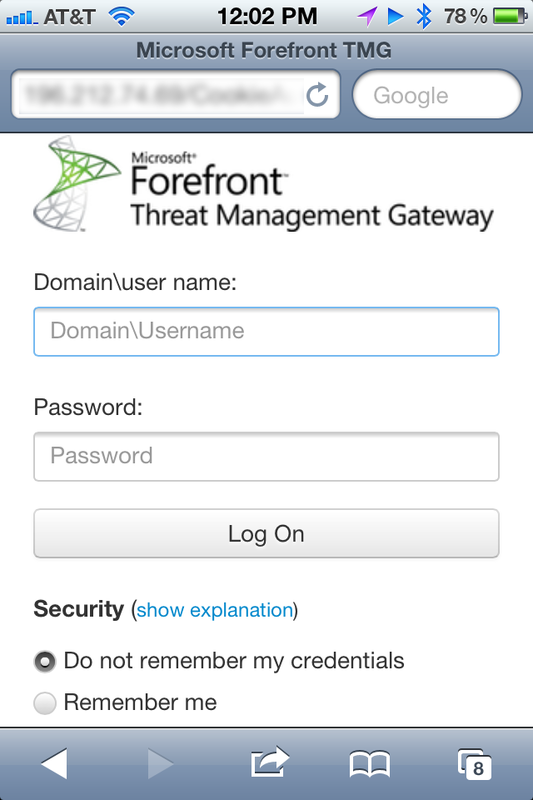 As far as I know, forms-based authentication in Forefront TMG can only be used to authenticate incoming requests for published web servers, not for outgoing proxy. now, can be used for outgoing proxy? 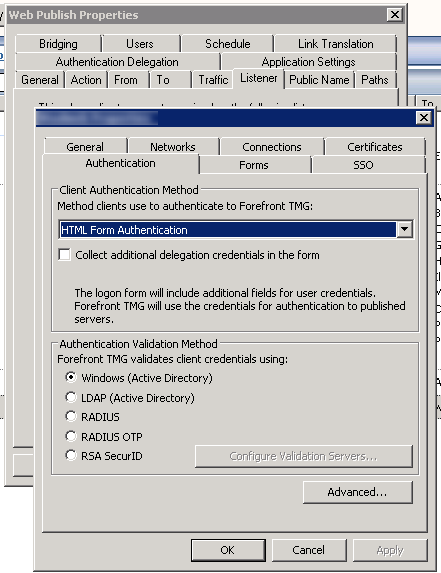 According to the documentation: http://technet.microsoft.com/en-us/library/cc995189.aspx, “Forms-based authentication in Forefront TMG can be used to authenticate incoming requests for published Web servers.”. There is no mention of using it for outgoing requests. This is great, thanks for this. Only question is this now, had anyone had any luck having the iPhone iOS keep the ISA/TMG credentials entered so they can be autofilled? It never seems to prompt me to save the username/password. Does anyone else share this problem? Have you turned on AutoFill in Safari’s settings? 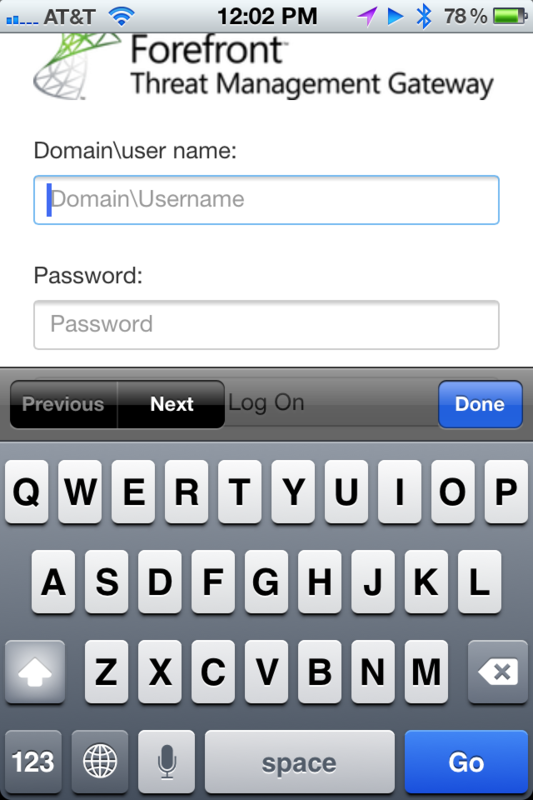 Go to Settings | Safari | AutoFill | Names and Passwords (switch to ON). Yes, I had this already enabled. Just doesn’t seem to want to work for this page…not sure why yet…anyone else replicate this issue? 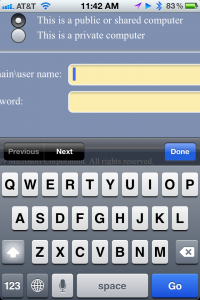 Removing the autocomplete=”off” should help you with autofill on your ipad. This is a fantastic guide. Thanks so much for sharing. I’ve adapted it to work for Exchange OWA based forms. slightly different steps but essentially the same concept. Terrific! Thanks for letting us know about the Exchange OWA template. I seem to have noticed a small quirk. Not sure if it’s just the way I’m using it or not. When I set this up for OWA (as I described on my blog) it doesn’t seem to recognise the “public/private” computer option. I find when using the default forms everthing works fine, but when using the mobile friendly forms my OWA sessions just seem to lose the connection. I don’t really know as this stage how to test for this and haven’t looked into debugging it, but only when using the mobile form for OWA do I need to re-connect multiple time each day. Any thoughts or suggestions what to look for? Sorry it took me a little while to get to this. Yes, I think I’ve found the issue. 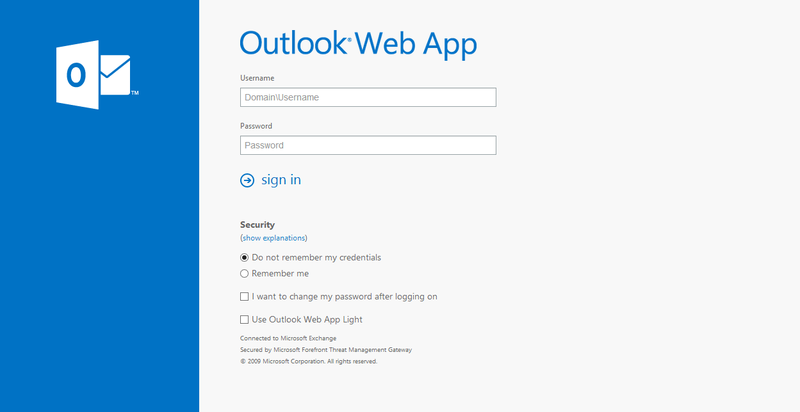 If you have ‘Remember Me’ checked, the login code then checks to see if the ‘Use Outlook Web App Light’ option is checked. I didn’t have this option on my version of the template, so the login code would fail. I’ve now created two version of the template, one for Exchange OWA and one for everything else. Check out the GitHub Repo for the latest files. Let me know how it goes and thanks for letting me know about this! Awesome stuff. I have one small issue. It all looks and works ok except for the fact that once I use the custom template the title gets changed to Outlook Web App and the bottom of the page also says Connected to Microsoft Exchange. Almost as if it thought that it’s publishing the OWA (OWA still has the original forms login). Any ideas as to what is causing this? That worked like a charm. Thanks alot! The GitHub repo has just been updated thanks to a fix from ablanken. It fixes an issue with the public/private computer option. Before the changes, TMG was acting as if the public computer option was always selected, even if the private computer option was chosen. This is a GREAT solution! However, my problem is that the interface is like the one in TMG for Exchange 2010. Do you have one for Exchange 2013? 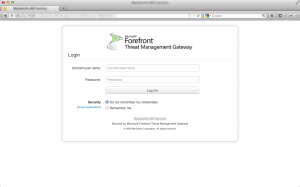 I read through Scott’s blog (http://kickthatcomputer.wordpress.com/2013/03/14/a-mobile-friendly-tmg-forms-based-fba-login-for-exchange-owa/) but he really does not explain how he got the Exchange 2013 interface to use. Hopefully either you or he will know the answer. Funny you should ask about this as I’m working on a template for Exchange 2013 right now. It’s not quite working right just yet, but I’ll hopefully make it available soon. In the mean time, I’ve heard from a good source that the ‘Exchange’ template in the existing package works for Exchange 2013, it just ‘looks’ like the Exchange 2010 style. Here’s a sneak peek at the new 2013 template that should be available soon. As always, YOU ARE THE MAN!!! I will be happy to help beta test it when you are ready. If this is like the rest of the Fastvue products, it will be GREAT! Just wanted to say thank you for this. Saved me from having to build it from scratch.. Our old company had a customized logo version and I wanted something similar.. Perfect timing that you released to 2013 version, because that’s what we put into production!! Great to hear it helped out Duncan! This is a fantastic resource. Thanks for sharing with us. I have struck a problem where the border, resizing and the Login text does not display in Internet Explorer 9.0.8112.16421 32Bit version. Safari and Firefox display correctly. I believe what you’re seeing is IE displaying the form in Compatibility Mode, rendering the page as if it was IE8. This is the default mode for sites in the ‘Intranet’ zone. I’ve added the X-UI-Comatible meta tag to all the HTML files to force IE to display the form with the latest rendering engine possible. Grab the latest usr_pwd.htm file and see how it goes. Be sure to clear the caches – both by restarting the Firewall service and by hitting Ctrl + F5 in your browser. You can also check the Compatibility Mode of your browser by hitting F12 to bring up the dev tools and playing with the Browser Mode and Document Mode menu items. Thx for sharing, nice upgrade to our tmg look & feel..
Maybe NeXT project could be modifying the change password page/confirmation. No problem Jan. I’ve since created an Exchange 2013 version of the files that includes the password forms. Grab the latest at https://github.com/scottglew/TMGResponsiveAuthForms and use the /Exchange2013 folder. Thanks very much for this. I also customized the Change Password process for ISA to match this. How do I submit those two extra files?